What does SQL Power Doc do? What problems does SQL Power Doc solve? Download the latest version of SQL Power Docs from GitHub. Typically, when we download the PowerShell script from the Internet, we run into the security issues. I know that the script is trusted, so I go ahead and unblock the security to allow the script to run. By default, PowerShell prevents any script that we downloaded from the Internet, from running. In order to allow the execution, we need to re-define the security policy. Next, list the PSModulePath—this is where modules are discovered from, by PowerShell. The $ENV:PSModulePath variable stores the paths where modules are installed on the disk drive. 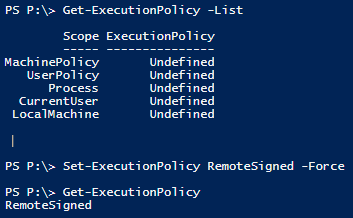 Note: The script module is simply a PowerShell script placed in the right location on the file system, with the right extension. If you’re familiar with the PATH environment variable, PsModulePath is very similar to that. So by calling the variable, you’ll see that it’s just a long string delimited with paths delimited using semicolons. PS C:\ &gt; New-Item -type directory -path "$([Environment]::GetFolderPath([Environment+SpecialFolder]::MyDocuments))\WindowsPowerShell\Modules"
The following output shows: the script collects an inventory by scanning hqdbsp18, hqdbsp17 for SQL Server instances. It includes the named instances as well. Note: By default, it uses Windows Authentication to connect to the instance. It means, the user account of the current session scope account will be used to connect to all the instances. By default, the output file will be written to your “My Documents” folder. A text document is used for all the standard logging. As I already mentioned, the output is a compressed XML file. At this stage, your data gathering is complete. You will want to generate the output as an Excel workbook. The above call writes the XML tags into the Excel files for the Database Engine and Windows Operating System information that are contained in ” C:\Users\ccov648\Documents\SQL Server Inventory – 2019-01-14-08-43.xml.gz”. Here, you’ll see that server input is fed from the input file. You can see that computername parameter is read using the Get-Content cmdlet. You can see that the script took 6 minutes to gather SQL Server and Operating system details. The execution time started at 8:55 and it got ended at 9:01. The execution time may vary, if you have named instance installed on the target machines. SQL Power Doc works well with most of the versions of SQL Server starting from SQL Server 2000 through 2017. You learnt how easily configuration information can be gathered using SQL Power Doc, and how it helps identify mis-configurations that can affect performance and stability. For example, it is that easy to check XP_CMDSHELL properties; SQL Server services configuration account details; CLR enabled or not etc:-. I will talk about this more in my next article. The report is generated in two steps: at the first step, the XML file is generated and in the second, the Excel file. If you’re still having problems using SQL Power Doc, please post your feedback (https://sqlpowerdoc.codeplex.com/discussions) or reach out to @SQLDBA on Twitter or Blog address: http://www.kendalvandyke.com/ I will discuss more about this SQL Power Doc in my next article.